The TurboTax Blog > Tax Deductions and Credits > What are Tax Deductible Medical Expenses? What are Tax Deductible Medical Expenses? When you begin your tax paperwork organization ritual, no doubt one of the top priorities on your list will be your tax deductions. And, as we all know, if you’ve paid any medical bills, been to the dentist, spent any time in the hospital, or had any sort of doctor-patient interactions, there is potentially a treasure trove of tax deductions just waiting to be discovered. But what can you deduct? What amount of your medical expenses are tax deductible? Do you have to show proof of the expenses that you’re claiming as deductions? 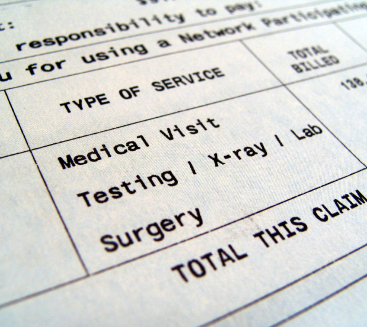 Whose medical bills are able to be deducted? These are some very common questions about medical expenses, so let’s just dive right in. More than a few people are surprised to learn that a portion of the cost of their medical and dental expenses can be subtracted, or deducted, from their adjusted gross income. However, on your 2012 taxes, only medical and dental expenses that meet the government’s minimum required amount, which is anything above 7 ½ percent of your adjusted gross income (AGI), are eligible. In other words, if your medical expenses aren’t equal to or greater than 7 and a half percent of your income, you can’t claim them as tax deductions. Of course, these expenses can only be deducted from your income if you itemize your tax deductions instead of taking the standard deduction. Whose Expenses Can Be Deducted? Whether you’re a first-timer in the medical deductions arena or a seasoned veteran, it’s important to know exactly whose medical expenses can be deducted from your income. Although almost everyone’s life (and therefore tax) situation is unique, you can somewhat generalize the rules about medical and dental deductions. Here’s the low-down: you can deduct your medical and dental expenses, those of your spouse, or the expenses of your dependent’s – if you choose to itemize. If you’re not sure about itemizing your deductions, TurboTax will figure out which choice benefits you best – itemize or take the standard deduction. Exactly Which Medical and Dental Expenses Can I Deduct? The government has an enormous list of qualifying medical and dental expenses that they have ruled as eligible for deduction on your income taxes. For a full list of every piece of information dealing with deductible medical expenses, see IRS Publication 502. For time’s sake, here are a few of the most common expenses (and some commonly overlooked expenses) that are deductible. The IRS updates the list of medical expense deductions quite frequently, from a tax perspective, so it’s important to know not only what is considered deductible, but what isn’t. I HAVE SPENT $81000.00TO AN ASSISTED LIVING FACILITY. HOW MUCH CAN THIS BE DEDUCTED? I have a compartment problem in the lower leg and to stay active I was told to get a stationary bike. That would help with the circulation and strength. Can I deduct this? I had to buid a special adaptive living quarters for my invalid parents who need constant in home care. Is the cost for the medically necessary addition tax deductible? My wife and I file a joint return. Are our annual premiums for long-term care insurance deductible as medical expenses? Also, we claim my wife’s mother as a dependent on our joint return, as we pay the majority of her expenses. If we also pay some of her medical costs, can we deduct those costs as medical expenses? I pay for part of my health care. My employer pays the rest. Can I deduct the portion that I pay? If I incurred medical expenses in 2014 are paying them off still in 2015 can the whole amount be deducted on my 2014 taxes? I elected to have gastric bypass surgery. My insurance wouldn’t cover it because my BMI wasn’t quite high enough. Is this surgery tax deductible even though it was elective? I paid cash. Can we claim stem cell therapy injections and treatments rendered at the Panama Stem Cell Center in Panama, Central America. The treatment is for secondary progressive multiple Schlorsis. I forgot to deduct some medical expenses in 2013. Can I deduct them in 2014 ? You would have to amend your 2013 taxes and claim your 2013 medical expenses there. My 74 yr. old wife has had knee replacement, she also has a heart condition. She has problem climbing stairs, all of our bedrooms are on the 2nd flr. of our home. Her heart doctor gave her a prescription for a stair-lift, which we had installed. Can any part of this be deducted as a medical expense ? If my mom was in assisted living after having a fall and breaking her hip and wrist and paid rent at that facility (not a skilled nursing facility) but also paid rent on her own home is that deductible? She did receive a CRP from that facility. Also had to have grab bars installed in her own home in her bathroom, is that deductible? Also uses a wheelchair and a walker, is that deductible? My huband is a commercial fishermen and files a 1099. when we got what he owes back this year it didn’t seem right. It seems like a lot more than he should owe do to having 20, 000 in medical write offs for the year. He made 82, 000 and has 20, 000 in medical expenses. Of that 20, 000 how much should have been written off?